Q: This time of year is often hard for many people – the holidays elicit much emotion; the beginning of the new year brings great hope. What advice would you give for coping with these often turbulent weeks? A: Remember that your parent (s) got through very difficult times, including the loss of their own parents and other loved ones. (If they could do it, so can you!) Remember in difficult circumstances that “This, too, shall pass.” – that we are all in a constant state of change, including the situation in which you find yourself. Remind yourself that you have managed to get through very tough times in the past and if you could do it before, you can do it again. Finally, always remember that each day, no matter how challenging it is, is followed by night and then a new morning in which the sun rises again and a new day begins filled with fresh hope and new intentions. Q: Why do many people attribute this time of year as a trigger for these types of emotions? A: Holiday activities tend to be similar to the activities we experienced as a child with our loved ones. As we age, our loved ones age as well and eventually die, leaving us with feelings of great sadness regarding our separation from them. When we involve ourselves in holiday events (be it lighting of menorahs, decorating the tree, baking, cooking, having family get- togethers, etc), we are reminded of times spent with them, and though we may have sweet, joyful memories, those very memories trigger sadness, knowing they are no longer here with us. Additionally, any feelings of loss in the present bring up similar feelings of losses from you past – which are stored in your cells. The result of this is that you feel overwhelmed by a sense of sadness and even despair. Q: What are some of the ways that you recommend individuals deal with pain and loss? Understand that loss means you have been separated from someone or something in whom or in which you have invested much of who you are. This can be so powerful feelings that it throws you off in all ways and causes you to often feel that your heart is broken and that you do not know who you truly are. You feel lost, angry, sad and confused. Give yourself permission to feel your pain rather than pretend it is not there. Your pain is real and needs to be honored and processed. It is stored in your cells as a low energetic vibrational experience.The key is to find ways to honor and release the pain stored at the cellular level. Crying, talking, screaming (such as in your car), punching a pillow (not a person! ), exercising…all help you to release your pain. Remember, tears are good in that they provide a necessary release. Allow them to come when needed. In dealing with loss, it is normal for you to lose your sense of identity which, in turn, leaves you feeling confused and lacking stability and confidence. Any kind of loss presents you with challenges which ultimately lead to the formation of a new sense of identity, one which feels more empowered, stronger and confident. For some, talking about your feelings and what you miss about your loved one is essential; for others, writing or journaling your feelings of missing your loved one enables you to process your pain or loss. Even writing a letter to your deceased loved one or to your angels or God, expressing your pain, anger, sadness, confusion is a good thing. Exercising offers another means of releasing your pain, as well as helping you to open up stored energetic blockages. Become informed about what normally occurs in grieving so that you feel you can better manage it – and do the work of mourning. Recognizing that your experience is relatively normal allows you to undergo the necessary process of separating from you hopes, dreams, loved one or anything or anyone that you grieve. Balancing your pain with laughter or anything that brings a smile to your heart is a good thing. Without the ability to laugh when grieving, you may become ill. Remember that everything is energy and therefore you want to balance the low energy associated with thoughts of loss with the high energy of thoughts that tickle you and make you smile and laugh. Laughter enables you to release endorphins which, in turn, help your immune system to better care for you. A major point to keep in mind: Any loss you have that feels overwhelming and terrible has vibrational, energetic equivalents from similar experiences of past losses stored in your cells. What happens is that your present loss will trigger and bring into the present the feelings of the older losses. Thus, you may feel overwhelmed by sadness and pain from both past and present losses. This is very common but most are not aware of how this works. Leave your house and go into Nature, be it a park, if in the city, or go for a walk in the country or by the beach. Nature provides you with your connection to your Higher Self, to God and the Universe. The energy of being outdoors with shrubs, plants, trees, mountains, ocean and lake water is simply higher and powerfully healing and uplifts you, by shifting your focus to what brings you peace and well-being. Not initially, but in time, as you begin to be aware that you are beginning to heal and are feeling a bit stronger, ask yourself questions such as “What is this teaching me? What are the lessons I am learning with this? And what might be the gifts this experience is giving me? These questions force you to perceive the situation differently, causing a shift in how you feel from not good to better and, perhaps, even good. Finally, take a few minutes, at least, daily, to close your eyes, breathe deeply, creating stillness, and from this quiet, still place, give yourself permission to see and feel yourself feeling more joy, being happy handling your difficult situation and experiencing peace. By doing this, you, once again, create a shift in your energy, balancing the pain of loss and moving you along in the direction of what you are imaging or visualizing. Q: You have written about the “ABCs.” What does this involve? The ABCs which I have written about and created for my patients and those who attend my seminars are the following: A is for Awareness of your feeling either good or not good at the level of heart and of the thought that is causing the problem. At this point, you may choose to acknowledge and feel the feeling, if you wish – or not. The next step is B - to Breathe deeply several deep breaths, with the intention of breathing out the pain. And C is for Choosing another thought that feels better when you focus on it and focusing on it for about a moment or so. By doing this, you are able to shift and experience greater well-being. Q: Your approach seems to combine common sense with energetic, spiritual, prayerful techniques. In what ways does this multi-faceted approach lend itself to furthering the healing process? Healing is about restoring balance, harmony and a sense of wholeness when you are out of balance, lacking a sense of harmony and peace and feeling disconnected from your true self. Such states leave you are feeling energetically very low and vulnerable to illness. By choosing to focus on that which feels good, or the Unconditional Love of Self and the Love of others, you energetically shift to a higher level which then releases chemicals which bolster you and your immune system, restores harmony and expedites the healing process. Q: What techniques work best for you? I give myself permission to cry, scream, etc., if I need to- and then consciously work to balance my pain with focusing on thoughts that feel better. Being energy conscious and aware that like energy attracts like energy, I practice being conscious of how I feel and think, then feel the emotion, breathe it out and replace it with something that makes my heart sing. My goal is to shift myself to a higher vibrational energy, enabling me to both feel better and have more positive experiences. When dealing with issues of loss, I remind myself that my responses are normal and that I will probably be pulling up other losses which felt energetically similar to what I feel in the present. I breathe deeply, consciously focusing on breathing in peace and breathing out all stagnant energy associated with fears and tension. This creates the release of chemicals that relax me and enable me to replenish my energy so that I can better handle the challenges facing me. I also always ask for clarity regarding what the experience might be teaching me. I ask questions such as “What is the lesson in this experience for me to take away? Or, what is this whole thing teaching me? These immediately help me achieve a higher perspective which, in turn, enables me to better manage the situation. What also works for me are powerful affirmations such as I AM that I AM and I Am not alone, but protected by my angels and the highest of divine energy (reminding myself that I am not alone and that the energy that created the Universe is a part of me with every breath I take). These affirmations gently remind me of my own sense of power and confidence in dealing with difficult situations. 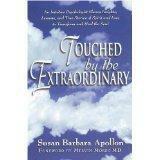 Susan Apollon is a psychologist, author and educator. For more than twenty-five years, Susan has been in private practice in Yardley, PA, evaluating and counseling adults, families, and children who are dealing with difficult life situations similar to what she has personally experienced, researched, and written about, including cancer, other health issues, trauma, and grief. She is an avid researcher of Mind, Consciousness, Intuition, Energy, Prayer, and Healing and brings this expertise to her three published books—Touched by the Extraordinary, Book Two: Healing Stories of Love, Loss & Hope; Touched by the Extraordinary: An Intuitive Psychologist Shares Insights, Lessons, and True Stories of Spirit and Love to Transform and Heal the Soul; and Intuition Is Easy and Fun: The Art and Practice of Developing Your Natural-Born Gift of Intuition (co-authored with Yanni Maniates). Five other modes of ‘focusing on breathing’ can be seen in this page http://countingbreaths.com/fob/relax/how-can-i-do-it/.